Mujib served twice as the President of Bangladesh, including the first presidency of the country and later during one party rule. He was assassinated by junior army officers in a military coup on 15 August, 1975. We gave blood in 1952, we won a mandate in 1954. But we were not allowed to take up the reins of this country. In 1958, Ayub Khan clamped Martial Law on our people and enslaved us for the next 10 years. In 1966, our people fought for the Six points but the lives of our our young men and women were stilled by government bullets. I had said, Mr. Yahya Khan, you are the President of this country. Come to Dhaka, come and see how our poor Bengali people have been mown down by your bullets, how the laps of our mothers and sisters have been robbed and left empty and bereft, how my helpless people have been slaughtered. Come, I said, come and see for yourself and then be the judge and decide. That is what I told him. Nor did they succeed in hanging me on the gallows, for you rescued me with your blood from the infamous conspiracy case. That day, right here on this racecourse, I had pledged to you that I would pay this debt with my own blood. Do you remember? I am ready today to fulfill that promise! There shall be no transaction between East and West Pakistan. All communications, telegraph and telephone, will be confined within Bangladesh. The people of this land are facing elimination.If need be, we will bring everything to a total standstill. Collect your salaries on time. If the salaries are held up, if a single bullet is fired upon us henceforth, if the murder of my people does not cease, I call upon you to turn every home into a fortress against their onslaught. Use whatever you can put your hands on to confront this enemy. Every last road must be blocked. As we have already learned how to sacrifice our own lives, now no one can stop us! As we have already shed blood, we are ready to shed more blood! This time the struggle is for our freedom, this time the struggle is for our independence! Joy bangla! Sir, you will see that they want to place the word ‘East Pakistan’ instead of ‘East Bengal’. We have demanded so many times that you should use Bengal instead of Pakistan. The world Bengal has a history, has a tradition of its own. You can change it only after the people have been consulted. If you want to change it, then we have to go back to Bengal and see whether Bengalis will accept it. Speaking to the Constituent Assembly of Pakistan in Karachi in 1955 during a debate on whether to adopt the One Unit scheme in Pakistan and divide the country into two provinces- East and West Pakistan. While speaking with a western journalist during proceedings of the Agartala conspiracy trial. Mujib was released within in seven months of his arrest as a result of mass agitation and wide scale civil disobedience in East Pakistan. Shouting out aloud during proceedings of the Agartala conspiracy trial. It was in response to a journalist, to whom he was whispering, who told him that it was inappropriate to talk under the watch of undercover officers. The Declaration of Independence on the night of 26th March, 1971. 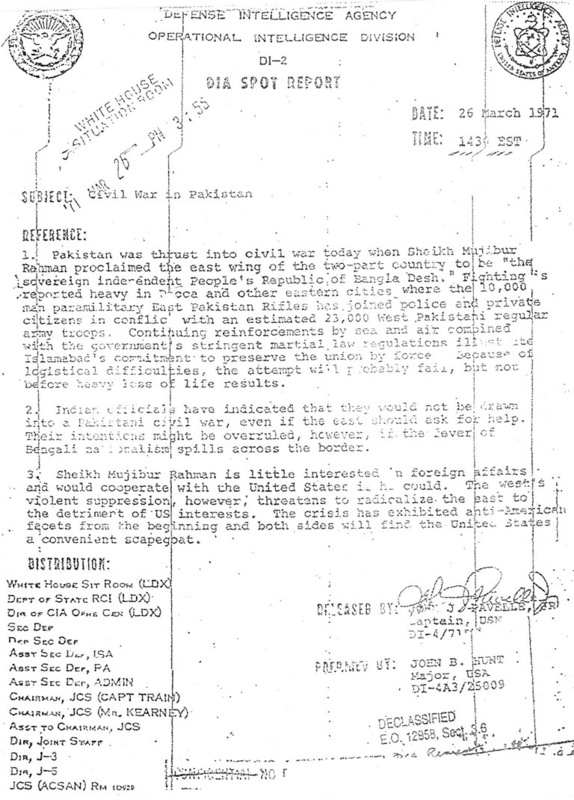 The declaration was made minutes before his arrest by the Pakistan Army. If we had remained in Pakistan, it would be a strong country. Again, if India had not been divided in 1947, it would be an even stronger country. But, then, Mr. President, in life do we always get what we desire? Speaking about the break up of Pakistan with Nigerian leader Yakubu Gowon. Replying to a question on whether he contemplated the Indian state of West Bengal joining his country and creating a "Greater Bangladesh". He was speaking to reporters at a press conference in London in January, 1972 after his release from prision in Pakistan. While being cheered with UAE ruler Sheikh Zayed Al Nahiyan as both men had the name Sheikh. Moudud Ahmed, Former Prime Minister of Bangladesh and Bangladesh Nationalist Party leader, in his book "Bangladesh, era of Sheikh Mujibur Rahman". 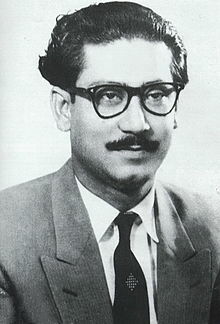 Saluting an icon of democracy, a towering personality and a great friend of India, Bangabandhu Sheikh Mujibur Rahman. Narendra Modi on his tweet after paying homage to the Bangladesh's founding father at Bangabandhu Bhaban in Dhanmondi, Dhaka. This page was last edited on 19 November 2018, at 18:15.